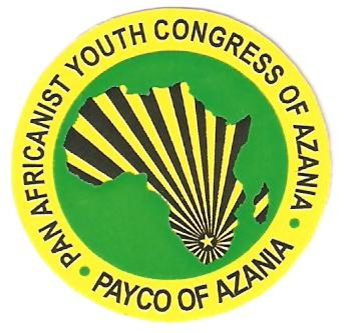 The Pan Africanist Youth Congress (PAYCO) of Azania wishes to express its objection to President Jacob Zuma’s immoral behavior and misrepresentation of African Culture to hide and promote his absurd anti-social actions. We call upon him to do an honourable thing for the good of the Zuma family, his wives and the Nation by resigning with immediate effect as the Head of State to save our country from the never ending embarrassment he keeps on causing. We wish to dissuade a myth that has been created by Zuma and his supporters that polygamous marriages are part of African Culture. We reject this lie with contempt. Polygamous relationships or marriages are not unique in Africa as at some point in history, they were practiced everywhere in the world by feudal lords, kings and wealthy sexist males. To this day polygamous marriages are still practiced in other parts of the world therefore we should not be dumped to accept it as uniquely African. Polygamy was practiced by the few rich and powerful in society who used it to demonstrate their wealth and power to society by breaking away from tradition of having one wife. They had to be seen to be different and capable to manage more than one family or wife. It is rare in history to find instances where a poor man has more than one wife. We regard polygamy as an outdated feudal practice that was there to serve the ruling class and has nothing to do with African culture. Let’s also indicate that culture refers to practices and values that are commonly practiced and accepted by all in society, not by the privileged few. In Africa and among Zulus to be specific it is practiced by less than 5 % of men and this makes it laughable and illogical to refer to this feudal practice as African or Zulu culture. As PAYCO we stand for a non-sexist socialist society, therefore reject the sexist entrenched polygamous marriages and those who continue to promote this feudal practice. We are conscious of the emotional abuse that women who are subjected to this practice endure on daily basis, whilst the feudal lords boast about their power and wealth. We call for the abolition of polygamous marriages to liberate our women from emotional abuse by the rich and powerful. We are dismayed by the childish conduct of some among the Zuma family who are continuously attacking the media for exposing Zuma’s unbecoming conduct. Let them be reminded that the same media was responsible for making Zuma the huge man he is today. Zuma’s popularity has mainly been driven by embedded media houses like Mail & guardian, Sowetan, Ukhozi FM, Ligwalagwala FM and many other media houses. The Zuma family should also be reminded that Zuma is the public figure who is expected to behave in a responsible and exemplary manner in his public and private life. We cannot for example accept to be led by a leader who oppose women abuse in public and fall silent when it comes to his own abusive relationships with women. The same applies to Zuma; he cannot talk about moral regeneration and being faithful to one’s partners in public and go around behaving in an immoral manner and having babies out of wedlock in his private life. We cannot accept to be led by chameleons and foxes dressed in sheep skin. Zuma chose public life and he must accept the package that goes with it; that you don’t have personal life as your personal life stands public scrutiny at all times, hence all our liberation leaders were expected to uphold high moral standards. By the way his private personal life is funded by tax payers and therefore he must account for all of his actions. The Zuma family must act in a responsible African manner by reprimanding their misbehaving son and remind him of his duties to the family, his wives and the nation, whilst on it pressure him to resign as State president. Just stop the senseless attack on the media. We reject the hypocritical manner in which the ANC has been treating Zuma’s scandals. Their approach on these issues shows lack of leadership and incurable disease of personality cult that it suffers from. We remain convinced that election of Zuma as South Africa’s President is the worst mistake the South African voter has ever made. We are also convinced that Zuma is out to destroy and disgrace African traditions and values. We reiterate our call for President Jacob Gedleyihlekisa Zuma to step down as the President of the Republic of South Africa.